Everyone loves a good bean dip. Hot or cold they are the perfect dish for easy entertaining or for a quick snack. The usual bean dip around our house calls for pinto beans and it's usually a layered dip. I wanted to make a snack for the kids, so I decided on a healthier bean dip instead of one filled with lots of fattening ingredients. I prepared and baked the bean dip before the kids arrived home from school. That way this would prevent any questioning of ingredients and anyone saying "I don't like that". Plus I could sneak just a little bit to go along with my lunch. 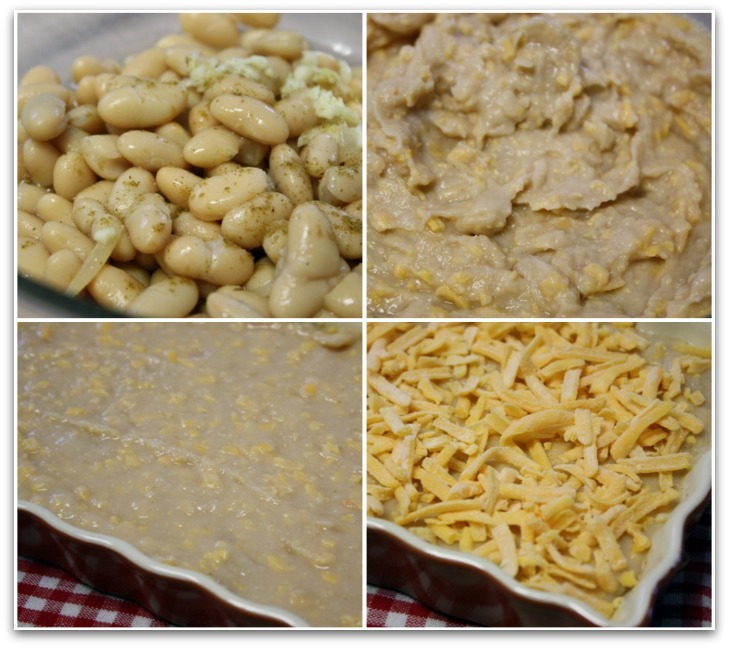 The bean dip recipe I chose to make was for a White Bean & Cheddar Dip. My kids love cheese so I thought this just might work. When I attended my First Bush's Beans Culinary Event in Napa , I was so excited to come home and really work on incorporating more bean recipes into my families diet. I wasn't worried about my husband because he loves beans just as much as I do. I knew my biggest hurdle would be with my children. After my trip and what I learned from Bush's Beans, I was really excited and ready for my challenge. I knew it was not going to be easy, but it's defiantly a positive work in progress. Just look at the photo above. That's Mackenzie and Gracie, the little girl I sit for. They have no idea that they are eating a yummy dip that is not only good, but healthy as well. This photo makes me a very happy mom. You see just last year my daughter wouldn't touch beans unless I hid them. And the only bean dip Mackenzie ate was the Frito bean dip in those little cans. I'm so proud of her on how far she has come since I started on "Project Bean". It's so awesome she is even asking me to add beans to so many different salads. Mackenzie's face was so funny when I told her she was eating a white bean dip. She said mommy it's so yummy and cheesy, I love it. Now Mr. Picky Pants Carson on the other hand turned his nose up to our delicious bean dip. But that's OK you have to know Carson to understand you see he dislikes so many things. But don't worry Carson cause you're eating beans my son and you just don't know it. Mommy is good at disguising them for you that you just don't catch on. Here are a few examples Black Bean Brownies, White Bean Banana Bread and Kid Friendly Taco Burritos. It's all about baby steps with Carson. My next chore is to try and incorporate them into a healthy cookie and muffin recipe. I hope you enjoy this recipe and maybe you will even give it a try in your house. My goal is to not only bring you outstanding bean recipes, but also bean recipes that your kids will like as well. Let's get started and I will show you just how easy it is to make them yummy white bean dip. Start by draining and rinsing one can of cannellini beans. Combine the beans, chicken broth, garlic and cumin in a blender or a use hand blender with a blade attachment. Process until smooth. Add 3/4 cup of the grated cheese and blend by hand until combined. Place the bean mixture in a oven safe baking dish. Sprinkle on the remaining cheese all over the top. Bake in a 375 degree oven for 15-20 minutes or until hot and bubbly. Let cool and enjoy with tortilla chips, pita chips or vegetables. Preheat the oven to 375 degrees. Combine the beans, chicken broth, garlic and cumin in a blender. I used my Cuisinart hand blender with the blade attachment. Process until smooth. Add 3/4 cup of the grated cheese and blend by hand until combined. Place the bean mixture in a oven safe baking dish. Sprinkle on the remaining cheese all over the top. Bake in the oven for 15 to 20 minutes. Serve with tortilla, pita chips, crackers or vegetables. Disclosure: I have entered into a paid, formal partnership with Bush’s Beans. With that being said I was not obligated to write this post. I'm just really excited to share all the yummy new ways that I'm incorporating beans into my family's diet. Disclosure Check! I love bean dip and can't wait to try this one out! Thanks!!! The white beans are so good. I would of never thought to use them in a bean dip. They are so smooth and tasty especially with the garlic. I thought my kids would turn their nose up to the garlic, but they really couldn't even tell it was even added. I love how much the kids are enjoying that dip! Must be some really good stuff. I love your blog, printing this for the weekend. My daughter just loves to dip things and she would go wild over this...and I also LOVE the flavors here. Nice to meet you.. Sounds delish. Perfect for the upcoming game!!!! I love this idea! My kids are HUGE bean eaters, and I bet they'd love it! I made this today for my Super Bowl Party. The dip was awesome and I couldn't believe how much it tasted like the stuff in the can (which I love). I added a little bit of crushed red pepper to give it a little kick. I suggest doubling up on the recipe because once I made the first batch, I realized how little it made and made another one. Thanks for the great recipe! I made this for a party and it was a huge hit. (I wrote about it here.) Thank you for sharing this recipe.